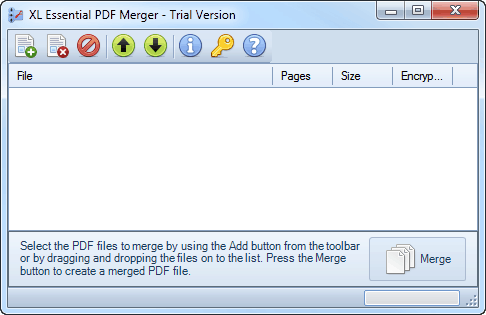 XL Essential PDF Merger - Merge two or more PDF files. Quickly merge two or more PDF files in 3 simple steps using a simple drag and drop user interface. Why use XL Essential PDF Merger? With XL Essential PDF Merger you can join multiple PDF files into one single PDF file. Use it to better organize your PDF files, archive multiple files together, or make sending multiple PDF files over email easier. It only takes 3 easy steps to create one combined PDF file. You can even use it with password protected PDF files. 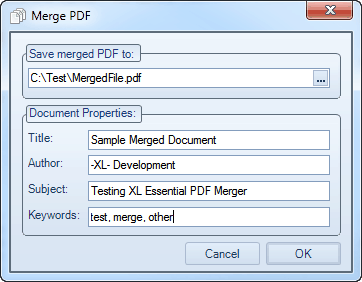 Merge multiple PDF files together. Simple to use drag and drop interface. Specify the order in which to merge files.